This hair mask is a great way of using up left-over egg yolks. It's also incredibly simple to do, with just the addition of a few kitchen cupboard staples. 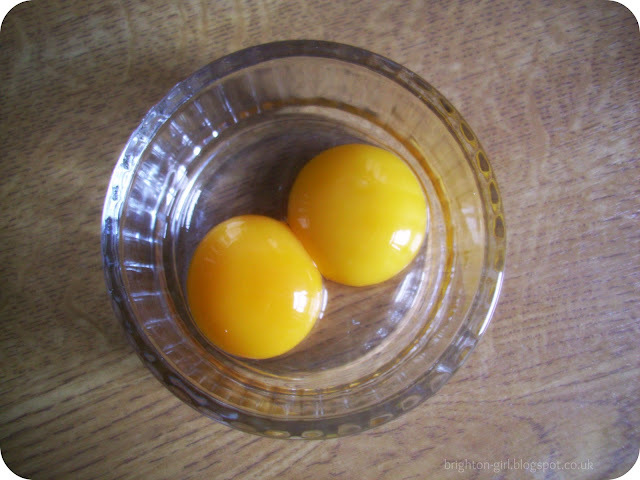 After I had made the Coconut Macaroons from my previous post, I was left with two plump yellow yolks. To these I added 1 dessertspoon of honey and 2 dessertspoons of olive oil and combined them all together with a fork. I applied the mask to damp hair and covered my head with clingfilm (although if you have a shower cap, use that instead)! I left the mask on for about 45 minutes. Make sure you wash it out with cold water so that you don't end up with scrambled egg in your hair! Then shampoo and condition as usual. There are so many combinations you can try for homemade hair masks. Bananas and avocados are potential ingredients to keep in mind, as well as other oils, such as almond or caster oil. After using this mask, my hair feels stronger and my split ends are less noticeable. It's definitely worth raiding your kitchen for homemade beauty alternatives. What homemade hair treatments have you used? Wow, I've always wanted to try an old fashion trick like this but I've never been brave enough! I need to pluck up the courage and just do it! I'd love to see some pics of the hair mask in action! I might try this eggy one on my hair today though. My mum gave me a great book from the 80s about home remedies and I'm eager to try them all!